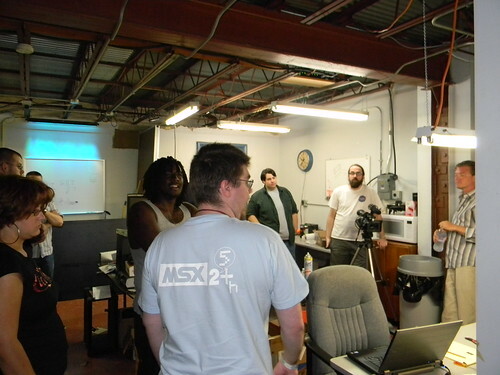 Last Friday night there was a good showing of visitors to the Lab. One of the projects getting a lot of attention was Beau's Maker Bot "Thing-o-Matic." Others showed up to meet up with fellow members and have a good time talking around the meeting area. Inverse Phase stops by during Open Hack Night with Chad. Good showing by members and visitors! Inverse Phase (Brendan Becker) and company look over towards the Maker Bot as it creates a bottle opener. Intriguing discussions of creation possibilities, designing models, and future plans of the 3D printer continue. 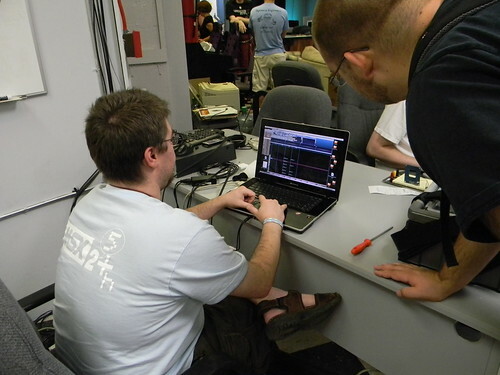 Inverse Phase demonstrating Chiptunes Tracking to Dave. Dave checks out the music tracking software Brendan is using in Ubuntu. A few demonstrations of white noise generation, Nintendo audio chip wave forms, and quick editing skills produces a recognizable tune in no time.